Friday, October 23, witnessed the most anticipated programming competition in Atlantic Canada. Teams from Atlantic Canadian universities gathered at Dalhousie University in a show-off of programming and problem-solving skills. Each team consisted of 3 participants, mostly undergraduate computer science students. The teams were given 5 hours to tackle 6 problems. The problem complexity ranged from easy, suitable for second year undergraduate students in computer science, to more complex ones that even graduates would find challenging. The algorithmic solutions to the problems ranged from basic searching and sorting, to dynamic programming, to geometry. 17 minutes into the contest, the SMU Huskies, led by my colleague Chris Adams, solved their first problem. Withing the hour, a few more teams solved their first problem, but by that time SMU Huskies had already solved their second problem. They were on the roll. At the end of the competition, the Huskies had solved 4 out of 6 problems, qualifying to compete at the ACM ICPC Northeast North America Programming Contest in Fredericton, NB, next Saturday. Congratulations to Chris and SMU for a well-deserved victory, and better luck for the other teams next year. This entry was posted in Events on October 24, 2009 by taa. The churches in Milano are just fascinating. I spent many hours during my trip in Milan going from one historic church to another. And although this started because there wasn’t much else to do, I kept going because I enjoyed it so much. I visited a total of 5 churches, each with a unique style, history, Christian artifacts, and wall paintings. 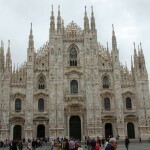 The first was Duomo, Milan’s most known treasure. Duomo is a huge church fully covered in engraved marble. All these statues and figures and patterns were all so detailed, so perfect, and so breathtaking. in the centre of the church, high above it, stands a golden statue of Virgin Mary. Basilica of Sant’Ambrogio had the oldest of the Christian artifacts, dating back to early Christianity and was built by St. Ambrose in the 4th century. Here I discovered that Victor is actually the name of a saint. 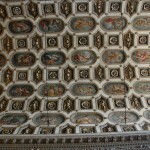 The most memorable elements of Santa Maria presso San Satiro were the hundreds of paintings of saints and angles painted on the ceiling of the church. The church, as many others, is kept dark. 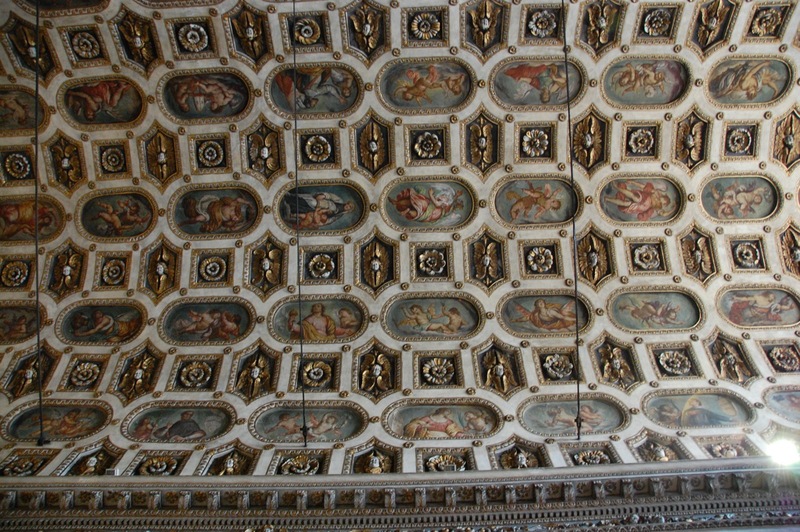 Therefore, to the painting are hard to see by the naked eye (having them on the ceiling doesn’t help either) but can be viewed with the help of a camera that is able to capture more light that the human eye. 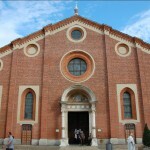 Santa Maria delle Grazie is a UNESCO World Heritage Site. 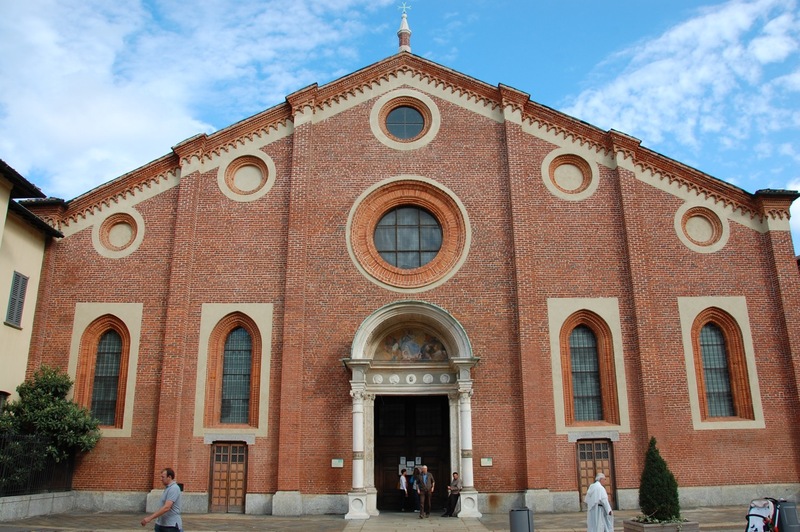 It is the church were Leonardo da Vinci painted the Last Supper, although the building housing the painting is no longer considered part of the church. Basilica of San Simpliciano captured my senses with all the art it houses, from paintings by famous and less famous artists, to stained-glass windows. The art comes from a wide range of periods, the earliest dating back to the 4th century. This entry was posted in Events on October 13, 2009 by taa. 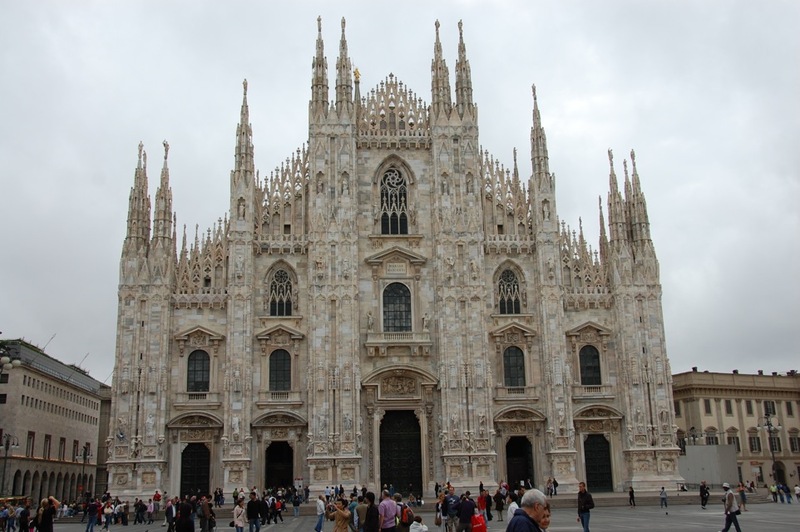 Milan has an extensive public transportation system that consists of trains, metro, trams, and buses. The train connects the Malpensa airport to Milan. The ride takes about 40 minutes and costs 11 euro. 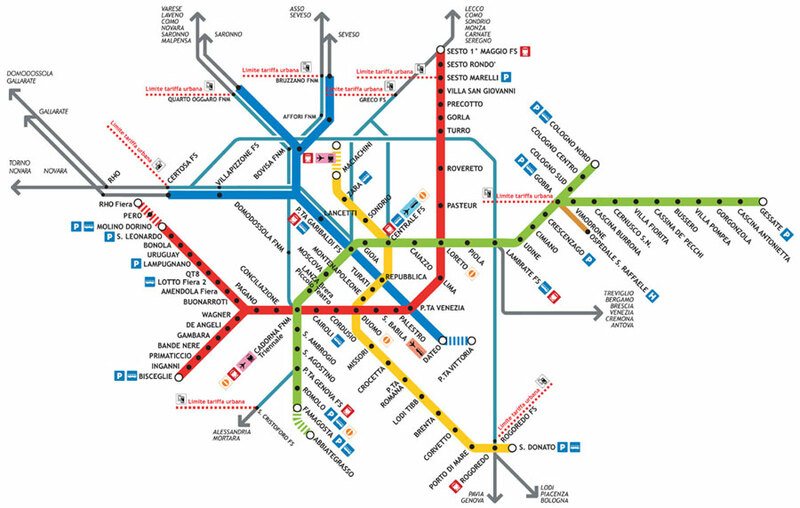 The city of Milan and the suburbs are covered with a star-shaped metro system. The metro run regularly, and there is insignificant wait time between trains during the day. City travel is only 1 euro, but if you’re coming from suburbs then it’s 1.5 euro. Covering the suburbs is a network of over 60 bus and metro lines, augmented with about 100 lines for urban area. Needless to say, such a large network can’t be printed meaningfully on a map. So while the metro map is posted all over the city and on all maps of Milan, the bus map is only accessible from the ATM website. Unfortunate for me, the ATM website was recently redesigned and the English version is “coming soon.” If you speak Italian, however, the site is quiet amazing with search functionality and public-transit routing directions. The map is interactive allowing you to view the bus/train arrival times for each stop. Keep in mind that Milan transport is imprecise, and it was common for the bus to arrive 5 minutes early. One inconvenience for visitors is that bus ticket must be bought it advance and validated on site. So if you’re at a hotel in the middle of nowhere with no stores selling bus tickets nearby, you’re out of luck. Or are you? You can still ride, as long you don’t get an inspector on your ride. As for private transportation, namely taxi, two things to keep in mind: except for high volume tourist areas, you pretty much have to call for a cab; and they take cash only. And it doesn’t matter that you call for a cab with credit card capabilities, they still take cash only and have a thousand excuses why they couldn’t process your credit card. I speak from a sample of 3! 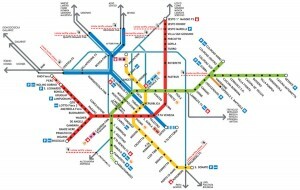 Milan metro map is courtesy of http://mappery.com. This entry was posted in Events on September 25, 2009 by taa. Third Wednesday (#thirdwednesday on twitter) is a monthly informal networking event. There is no RSVP or membership, just show up at Foggy Goggle on Argyle Street between 5-7 PM on the third Wednesday of the month. Over 35 people attended the August meeting. A few prizes were given away in a mini-contest, where answer to questions were submitted through twitter (although the questions themselves were not). All in all I think it is a great, relaxing event to meet locals from all industries who are passionate about the Internet, the Web, and the new social communication tools online. This entry was posted in Events on August 19, 2009 by taa. The Royal Nova Scotia Tattoo Festival is a yearly tradition in Halifax, NS featuring performers and miltary bands from around the world. The first time attended the festival was back in 2005 and I absolutely loved it. It was such a well organized show, so many performer, amazing bands, dancer, acrobats, and clowns. And the best part of it all was the finale were all the bands would play in unison creating a grand orchestra. I loved the NS Tattoo so much that I went back the following year in 2006. It was not as big or as good as the 2006 show, but it was still enjoyable. In all honesty, there was a little bit of disappointment that it was getting smaller, yet the performance of 2006 made up for big part of that. The 2006 year was special for NS tattoo, it was the year it was given the Royal status by Her Majesty the Queen for her 80th birthday. In 2007, the cast was shrinking even more. I thought I’d give it the benefit of doubt and attended anyway. Maybe if it was my first time attending I would’ve liked it, but seeing how it didn’t live up to the 2006 show, leave alone the 2005 performance, I must say I was greatly disappointed. I felt cheated in many ways because the prices didn’t go down, but the quality did. I had hopes that achieving the Royal designation would help the festival grow, but it was not to be. I had to skip 2008 for personal reasons – by son was under a year old, I was 2 month away from defending by PhD dissertation – not a good time for big fun events. This year, in 2009, “performer from around the world” really refers to only nine countries: Canada, Belgium, Denmark, Estonia, France, Germany, Sweden, United Kingdom, and United States. There are a total of 30 groups confirmed, but 20 of them are from Canada. This is very different from previous years were we had more international participation. I am especially disappointed that the Russian and Ukrainian dancers are not in this year’s show. My plan for this year is to go see the parade and then decide whether to attend the big show or not. One piece of advice: if you’re planning to attend, go for the cheap tickets. I’ve tried different seating and they were all equally great. There is typically plenty of empty seats, so moving around is possible if your seat turns out to be not so great. This entry was posted in Events on June 24, 2009 by taa. This list will be updated as I remember/discover more interesting papers. Graph Based Crawler Seed Selection – Zheng, Shuyi and Dmitriev, Pavel and Lee Giles, C.
If you’d like to recommend other papers to be added this list, contact me! This entry was posted in Events on May 7, 2009 by taa. From April 19 until April 26, I was in Madrid, Spain, attending the 18th World Wide Web Conference (WWW2009). I kept a live account of the conference and Madrid from my perspective at the twitter user @www2009. All my tweets are listed below. For a more comprehensive view, search for #www2009 on Twitter. This entry was posted in Events on April 28, 2009 by taa. The World Wide Web Conference (WWW2009) will be held in Madrid, Spain, April 20-24, 2009. I will be co-presenting two papers at the Developer track. The first paper is co-authored with Jason Hines and entitled “Query GeoParser: A Spatial-Keyword Query Parser Using Regular Expressions”. The second paper is co-authored with Christopher Adams and entitled “Creating Your Own Web-Deployed Street Map Using Open Source Software and Free Data”. Both papers will be presented in the afternoon of Friday, April 20. The schedule, as well as a link to the proceedings, can be found on the Developer’s Track page. The paper abstracts follow. Abstract: There has been a growing commercial interest in local information within Geographic Information Retrieval, or GIR, systems. Local search engines enable the user to search for entities that contain both textual and spatial information, such as Web pages containing addresses or a business directory. Thus, queries to these systems may contain both spatial and textual components—spatial-keyword queries. Parsing the queries requires breaking the query into textual keywords, and identifying components of the geo-spatial description. For example, the query ‘Hotels near 1567 Argyle St, Halifax, NS’ could be parsed as having the keyword ‘Hotels’, the preposition ‘near’, the street number ‘1567’, the street name ‘Argyle’, the street suffix ‘St’, the city ‘Halifax’, and the province ‘NS’. Developing an accurate query parser is essential to providing relevant search results. Such a query parser can also be utilized in extracting geographic information from Web pages. One approach to developing such a parser is to use regular expressions. Our Query GeoParser is a simple, but powerful, regular expression-based spatial-keyword query parser. Query GeoParser is implemented in Perl and utilizes many of Perl’s capabilities in optimizing regular expressions. By starting with regular expression building blocks for common entities such as number and streets, and combining them into larger regular expressions, we are able handle over 400 different cases while keeping the code manageable and easy to maintain. We employ the mark-and-match technique to improve the parsing efficiency. First we mark numbers, city names, and states. Following, we use matching to extract keywords and geographic entities. The advantages of our approach include manageability, performance, and easy exception handling. Drawbacks include a lack of geographic hierarchy and the inherent difficulty in dealing with misspellings. We comment on our overall experience using such a parser in a production environment, what we have learnt, and suggest possible ways to deal with the drawbacks. Abstract: Street maps are a key element to Local Search; they make the connection between the search results, and the geography. Adding a map to your website can be easily done, using an API from a popular local search provider. However, the lists of restrictions are lengthy and customization can be costly, or impossible. It is possible to create a fully customizable web-deployed street map without sponsoring the corporate leviathans, at only the cost of your time and your server. Being able to freely style and customize your map is essential; it will distinguish your website from websites with shrink wrapped maps that everyone has seen. Using open source software adds to the level of customizability – you will not have to wait two years for the next release and then maybe get the anticipated new feature or the bug fix; you can make the change yourself. Using free data rids you of contracts, costly transactions, and hefty startup fees. As an example, we walk through creating a street map for the United States of America. A Web-deployed street map consists of a server and a client. The server stores the map data including any custom refinements. The client requests a portion of the map and the server renders that portion and returns it to the client, which in turn displays it to the user. The map data used in this example is the Tiger/LINE data. Tiger/LINE data covers the whole of the USA. Another source of free road network data is OpenStreetMap, which is not as complete as Tiger/LINE but includes additional data such as points of interest and streets for other countries. Sometimes the original data is not formatted in a manner that attributes to a good looking, concise map. In such cases, data refinement is desired. For instance, performance and aesthetics of a map can be improved by transforming the street center lines to street polygons. For this task, we use the Python language, which has many extensions that make map data refinement easy. The rendering application employed is MapServer. MapServer allows you to specify a configuration file for your map, which consists of layers referencing geographical information, as well as the style attributes to specify how the layers are visualized. MapServer contains utilities to speed up the rendering process, and organize similar data. On the front end, we need a web-page embeddable client that can process requests for map movements, and scale changes in real time. In our experience, OpenLayers is this best tool for this task; it supports many existing protocols for requesting map tiles and is fast, customizable, and user friendly. Thus, deploying a street map service on the Web is feasible for individuals and not limited to big corporations. This entry was posted in Events on April 11, 2009 by taa. This year was the first time I participated in Earth Day. From 8:30 PM to 9:30 PM Atlantic Time, all the lights in my house were off. My family and I enjoyed a romantic dinner lit by numerous candles. We had a few objectives in doing this. First, to participate in a growing international movement and save power consumption during this special hour. Second, to remind oursevles of the importance to conserve energy usage and pledge not to be wasteful. Third, to enjoy an evening with candle lights, something that we rarely do. 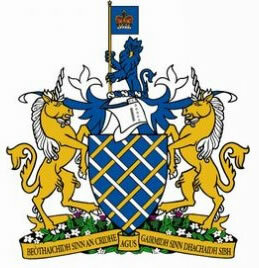 This entry was posted in Events on March 29, 2009 by taa. Who is “the Coolest Guy on the Internet”? Apparently there is an unofficial contest in the SEO world that started earlier this month to rank number one on Google for “”the Coolest Guy on the Internet”. The contest runs until the end of February and the winner gets one year of bragging rights. I decided to participate in this contest as an interactive audience by voting for my friend Andrew to be the Coolest Guy on the Internet. I invite you to participate as well, either as a contestant or an active spectator and vote for your favourite SEO guy. You can monitor the contest in near-real time by searching for the phrase on Google. The current leader in the contest is Mr. Brad Fallon, and it looks like he’s taking it pretty seriously. This entry was posted in Events on February 17, 2009 by taa. Markus on eMail, e-mail, email, or Email? Gregory on eMail, e-mail, email, or Email?